Dr. Tvrdoň epitomises everything we stand for and the clinic proudly bears his name. Following in the footsteps of his father Ladislav Tvrdoň, one of Slovakia’s first dentists, he is the guarantee of the highest level of expertise and professionalism. You can still meet him at our clinic on a daily basis and if you’re interested in an extended lecture on stomatology, just ask him a question. 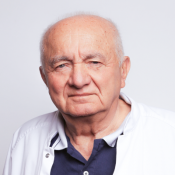 After having lectured at the Prosthetic Department of the Stomatology Faculty of Medicine of Comenius University in Bratislava for 46 years, Dr. Tvrdoň has got a lot to say. Throughout his career as a respected international authority, he has lectured at conferences all over the world ranging from the Loyola University in Chicago to Moscow and St. Petersburg. He holds more than 50 patents in stomatology, with quite a few of them contributing significantly to the advance of tooth care. With his latest book having been published only recently, Dr. Tvrdoň never ceases to amaze us with his dedication. There can be little doubt, that for him, stomatology is a lifelong mission and passion. 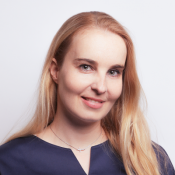 After getting her degree from the Faculty of Medicine at Pavol Jozef Šafárik University, in Košice, Marta continued her qualification in the Czech Republic, learning from the best professionals in Central Europe. She’s a specialist in aesthetic dental medicine and ceramic reconstruction, so if a beautiful smile is what you’re looking for, you’ll probably end up with her treating you. Once she flashes her own beautiful smile at you, you’ll know exactly why we value her so much. 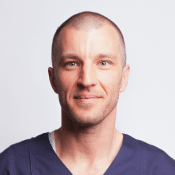 When it comes to dentistry, the Pavol Jozef Šafárik University in Košice is the one place you want to get your degree from, as Martin did in 2005. He then worked as a dental surgeon, which, as he says, naturally directed him towards implantology. Specializing in implantology and surgical stomatology now and with eleven years of experience under his belt, he is our premier implantologist. Martin is also a very outgoing person, so expect him to explain everything to you before you get your dental implant. 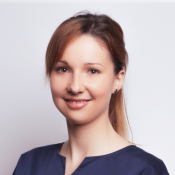 Having studied under the direct supervision of Dr. Tvrdoň, the head of our clinic, Kristina is remembered as a very thorough and ambitious student, so we’re very happy she has decided to be a part of our team. Even before taking her maternity leave, Kristina finished her degree in stomatology at Bratislava’s Comenius University in 2007. She further enhanced her qualification by acquiring a certificate in dentoalveolar surgery. 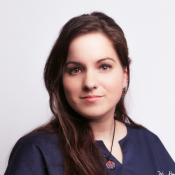 Kristina specializes in the more complicated procedures, where surgery is needed, but you can always be sure she will be just as professional and attentive to detail as she was when Dr. Tvrdoň led her all the way to becoming a top class stomatologist. We absolutely love Sabina for her character. She is very warm-hearted person with a special connection to children, that’s also why she participated in the Healthy Smile Project aimed at kindergartens. Sabina graduated from Comenius University’s Faculty of Medicine in 2007 and got her attestation three years later. 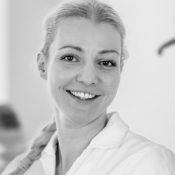 She now specialises in aesthetic stomatology ranging from prosthodontics and endodontics to tooth extraction. For a few years, she also worked as a first aid doctor, but that’s exactly what you won’t need once you meet Sabina. For her, stomatology definitely is a passion, not a job. Monika is one of our young talents. After finishing her master’s degree at Comenius University’s Faculty of Medicine in 2012 she worked as an emergency stomatologist, but has been a member of our team since 2014. (chýba, čomu sa venuje). Also, she speaks perfect English, so if you like a good conversation during your treatment, she’ s your go-to person. Her passion in the field is direct aesthetics, endodontics, and prosthetics. 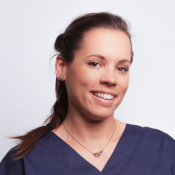 She graduated from dental school at the UPJŠ College in Košice in 2013 and been involved in many courses and educational activities during her studies. Zuzana really is a very active professional. She has successfully trained more than 1,000 children and students at the maternal, elementary and secondary schools as part of the Dental Alarm program. Ján is the multitalented one in our team. 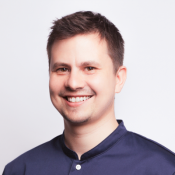 While acquiring a degree in economics, he decided stomatology was his passion and studied at two universities at the same time, he graduated from the Faculty of Medicine at Pavol Jozef Šafárik University in Košice in 2016. Ján describes stomatology as a fascinating passion and he means it: the seminars he has taken part in are too many to be even named. Finishing her degree at Pavol Jozef Šafárik University in Košice only in 2016, Dana is a newcomer to the team, but she has already won us over with her dedicated and professional approach. To her clients, she is also very friendly and helpful. 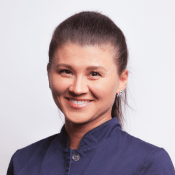 Dana’s field of specialization is aesthetic stomatology, prosthodontics, and endodontics, but she is also treasured by our youngest clients, who love her for her patience and friendliness.